Douglass Country Community Foundation Program and Communications Officer Marilyn Hull and Douglas Country Community Health Department Community Health Planner (and Lawrence Central Rotary Member) Charlie Bryan came to present the findings of the Lawrence Pedestrian Bicycle Issues Task Force Report released earlier this year. It may be as simple as walking or wheeling from a car or bus stop to a grocery store or doctor’s office. It may be riding a bike to school, or walking to work, or wheeling to a downtown event. Everybody needs safe ways to move around the community. Because the need is universal, the City of Lawrence Pedestrian-Bicycle Issues Task Force has taken an inclusive approach to studying our walking, wheeling and bike-riding environment. Our findings and recommendations are geared toward providing additional safety and comfort for all ages and abilities. They also pointed out that Lawrence has 72 linear miles of streets with no sidewalks. The report asserts that Lawrence’s sidewalk maintenance policy is ineffective, resulting in a deteriorating pedestrian network. Many sidewalks don’t provide adequate access for people with disabilities or seniors with mobility limitations. 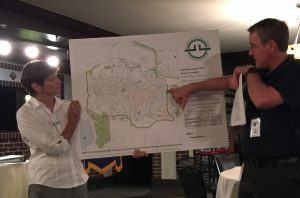 They also showed members a recommended map of upgrades and additions to the local bike and multi-use path network that would ultimately complete the loop around Lawrence. 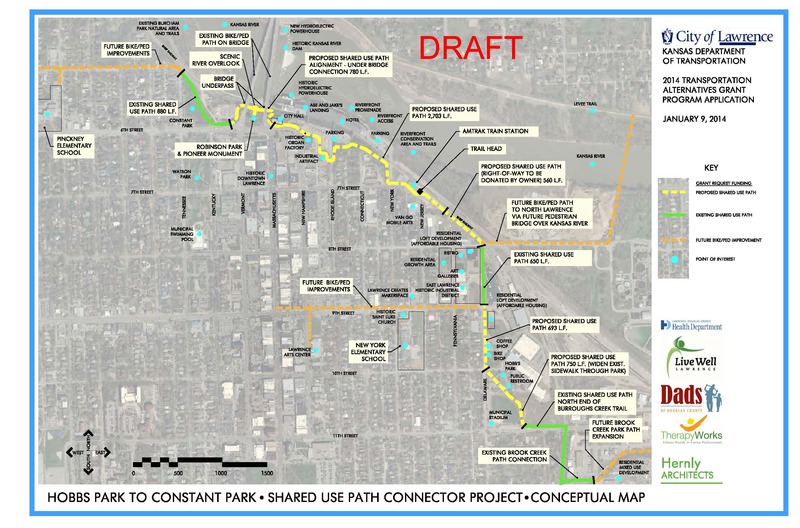 On February 4, the Lawrence City Commission is considering a Transportation Alternatives KDOT grant application to extend the Burroughs Creek Trail by creating a new multi-use path from historic Hobbs Park in the East Lawrence neighborhood through downtown Lawrence to Constant Park in the Pinckney neighborhood. The members of Lawrence Central sent Mayor Mike Dever a letter expressing our support for this grant application being submitted by the City of Lawrence. 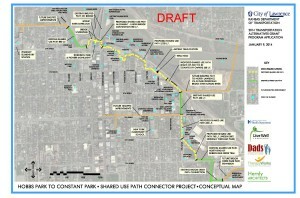 The proposed route will connect the Arts District to Downtown. 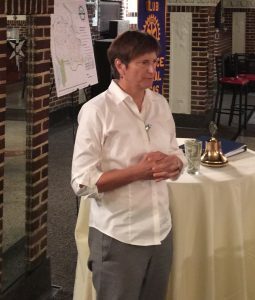 Lawrence Central Rotary understands the importance of multimodal transportation in the Lawrence-Douglas County Region and throughout Northeast Kansas. Lawrence Central Rotary also strives to support local government commitments to create multimodal infrastructure and particularly the development of facilities for bicyclists and pedestrians. Many different types of people in our region use our area’s bicycle and pedestrian facilities, and they desire to have a transportation system that is supportive of healthy and active transportation choices. Lawrence Central Rotary strongly supports efforts to create a complete transportation system for Douglas County, and we believe that this proposed TA project will help in that effort. Lawrence Central Rotary hopes that this project will be a fundamental first step of the local commitment to connecting the East Lawrence neighborhood not only to Downtown but also provide a pedestrian route that could access the Lawrence Memorial Hospital. 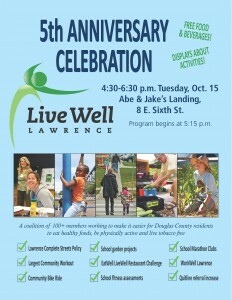 Live Well Lawrence Celebrates 5 Years! 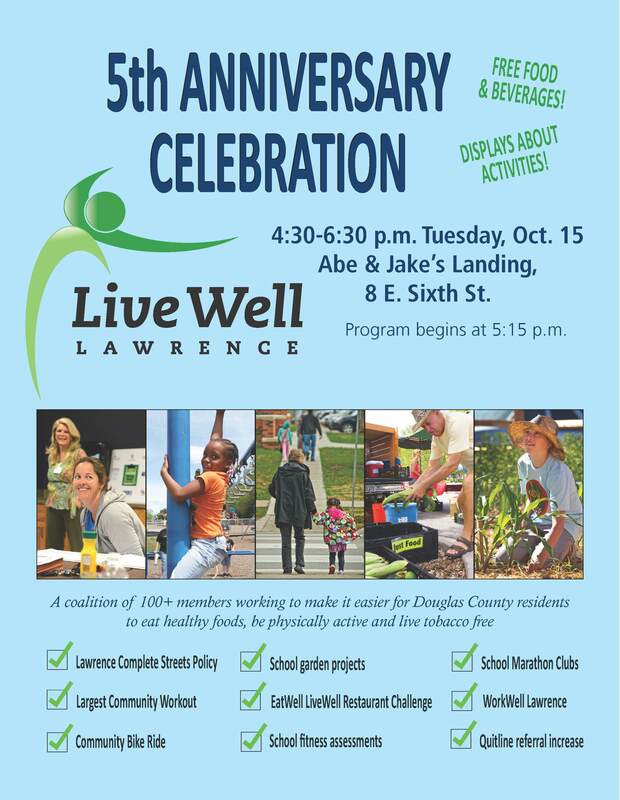 You are cordially invited to the fifth anniversary celebration of LiveWell Lawrence. The celebration will be from 4:30 p.m. to 6:30 p.m. Tuesday, Oct. 15, at Abe and Jake’s Landing, 8 E. Sixth St., in downtown Lawrence. LiveWell Lawrence is a coalition of more than 100 community members who are working together to make it easier for Douglas County residents to eat healthy foods, be physically active and live tobacco free. We hope you can attend the event and celebrate our community’s successes, which include passage of a Complete Streets Policy in Lawrence, adoption of school marathon clubs and school gardens, and establishment of WorkWell Lawrence, a network of employers who are working together to create a culture of health in the workplace. There will be free food and beverages along with information booths about community activities ranging from school gardens and bicycling to workplace wellness and transportation planning. It’s a great opportunity to network and learn about LiveWell! Lawrence Central Rotary and Ride Lawrence will be set up with information about local biking and other exciting giveaways! Help us promote the celebration. Download and share the event flyer here. The story below is from the Smart Growth America National Complete Streets Coalition.